Laying a turf / sod new lawn is relatively easy if you follow a few key guidelines. Choose a long straight line as the starting point to lay the turf / sod. Press each piece as closely as possible to the adjoining pieces. Press the grass into the prepared soil bed to bring it into close contact with the soil below - this will encourage quicker rooting. If you have a roller, use it for this purpose. Lay the turf / sod in a brick like pattern with no two joins adjacent to each other (see diagram below). Water as you go along - turf / sod should be watered an hour or so after laying otherwise it will dry out. 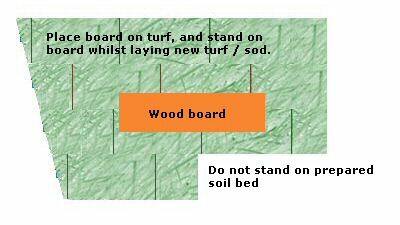 Do not tread on the prepared soil bed - lay a board on the existing turf/sod and stand on that to lay more turf. Curved areas can be shaped by curling a hose into the required shape and cutting the turf round the outline of the hose. If there are any hollows in the soil bed, even them out by spreading in sifted soil. If there are any mounds, cut them out before the turf / sod is placed in position.